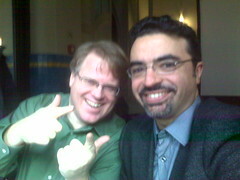 I’m sitting next to Ouriel Ohayon who runs TechCrunch France. We’ve just gotten a preview of the companies that will be showing off at LIFT’s Venture Night. Ouriel just showed me a cool site that he just learned about on Twitter. It’s called Issuu.com and you can upload your own PDF and it turns it into a nice slide show that you can embed on any site. Very cool. UPDATE: here’s Ouriel’s post, but his has a graphic, so will get more visits. UPDATE2: Webware wrote about Issuu a couple of days ago. Mondo cool, you should check that out. This isn’t the weed talking I promise but that Issuu site is pretty awesome. Nice recommend. Great opportunity to meet that guy :D.
hi robert, issuu is a very cool danish tool. ps: we-ve just ran a story this week about the WEF and the bloggers – especially jealous swiss bloggers, who won’t get an invitation for the wef (unlike you or michael arrington). matthias luefkens told me last week, that he has just 10 invitations for the whole web 2.0. community worldwide… and swiss blogs have no reach, compared to the big us-blogs. Great seeing you and talking to you at LIFT tonight. My camera died a minute into our chat, so I’ve unfortunately lost most of the video. I’ve posted excerpts in my own words on the NewsCred blog. Enjoy your time in Geneva! Bon jour monsieur! Issuu.com est tres bon. It is great and easy to use. I have uploaded two documents to the Issuu site and they look so good and are very easy to navigate round. I need to move from slide.com; the pace of change of technology. I sent you a tweet about a MixIn video on YouTube but thought I would post it here too in case anyone else is interested. If you can understand basic French you should be able to follow the demo. D’OH! Might help if I actually posted the link!